Rock gods Sting and Peter Gabriel are a perfect marriage and can still rock the roof off a venue, evidenced by their "Rock Paper Scissors" show, which hit the United Center on Saturday night. Minutes following, entering stage left rocking his bass guitar was the man who’s real name is merely non-existent and simply known as Sting. Sting and Gabriel complemented each other the entire night, keeping audience members on their feet after playing cut after cut of thriving hits that have spanned and stayed relevant for nearly five decades. The three-hour performance found the icons bouncing back and forth, and even collaborating on some of their classics. The night was never full of surprises, just soulful euphoria of two of the industry’s greatest ambassadors. The collaboration seemed as smooth as the creation of a top super group and songs like “Driven to Tears” and “Red Rain” almost left you forgetting which hits were whose. Sting and Peter Gabriel brought their "Rock Paper Scissors Tour" to Chicago's United Center Saturday, June 9, and it turned out to be one of the most musically satisfying concerts I had seen years. Both men are in their mid-60s, but you couldn't tell that from the way they were running and jumping all over the stage. They seemed to feed on each others energy, and the audience ate it up. Before you think this was a typical double bill of “I’ll do a set, then you do a set, and then we'll do some duets,” no, no, no! Far from it. With the exception of a handful of songs, both men shared the stage the entire night taking turns doing their songs, or doing each others songs, or collaborating on songs. Together they brought with them two bands totaling 14 musicians, and there was a combination of both bands performing many of the songs throughout the night. As Gabriel put it, they had a good natured battle of the bands. The best part was that everyone on the stage looked like they were having the time of their lives; no trace of ego could be seen during the night. Sting and Gabriel were the best example of this. It was easy to tell from their banter and playful joking that they enjoyed each others company. When not singing lead, they would each sing background for the other. They also provided musical support for each other on several songs; Gabriel on keyboards for Sting, and Sting on bass for Gabriel. Gabriel played a brand new song called "Love Can Heal" that was written for slain politician Jo Cox, who was a friend of his. He also did a bluesy cover of Sting's "If You Love Somebody Set Them Free.” Sting's scorching version of "Roxanne" morphed into a jazzy mid-section that became Bill Withers' "Ain't No Sunshine" before transitioning back into "Roxanne.” A highlight for me was seeing Sting rock the bass on Gabriel's "Big Time" with Gabriel's bass player Tony Levin looking on in approval. The entire group of musicians took their bows after a fantastic rendition of "In Your Eyes,” where Sting and background singer Jenny Abrahamsson improved on the famous Youssou N'dour vocal part. After a very short time everyone came back out for encores of "Every Breath You Take" and "Sledgehammer,” with Sting and Gabriel trading vocals on both songs. The whole show clocked in at around three hours, and the audience wanted more. It was a brilliant collaboration of two artists who still enjoy playing live and definitely enjoyed being on stage together. I hope the way they put their show together will become the standard for co-headlining acts in the future. Sting and Peter Gabriel are standing shoulder-to-shoulder ten minutes into the Rock Paper Scissors concert. They are each holding a microphone looking as if they are about to launch into a comedy routine, but instead they are setting expectations with the crowd. No, this is not standard opener/headliner show and it is not a concert where the headliners both play shortened sets while maximizing their profit and lessening the fan experience. Gabriel and Sting are reinventing the book on co-headline tours. Imagine a show where two top tier artists face- off not on how well their albums sell, how much money they make, how good their backing dancers are, but by how good their bands are? When I last saw Sting it was in February of 2014, he was venturing on a similar setup with Paul Simon. However, while there was camaraderie on that tour, the generation gap made this jaunt with Gabriel feel like more of a friendly competition. First off, Sting and Gabriel were widely visible as the musical movement leading Amnesty International nearly three decades back. They explained how they brought their bands together for rehearsals many months ago and how they challenged each other song-by-song, theme by theme with the rivalry even spilling over into the effects. Gabriel opted for a low-key approach often performing behind his keyboard to stage left with dark illumination, while Sting stood front and enter basking in the expansive beams. Their music echoed light and darkness with their cumulative efforts taking the audience through a museum of heartache, enlightenment and euphoria. I will go on record that I have never seen two artists of this caliber integrate as seamlessly as they did during the course of this concert. Sharing the stage for the first time since 1988, both artists bring a worldly view through their musical exploration and their contemplative lyrics. I cannot lie; both catalogs have informed my musical understanding more than this review will allow me to express. From pop-music to deep brooding mood records that are as gory as Bob Dylan's Blood on the Tracks and as heart wrenching as Nirvana's In Utero. Albums such as So, Us, The Soul Cages and Ten Summoner's Tales never leave my iPod. The screen hanging over the stage before the show featured a cow on one side and a ship on the other. As they explained, Gabriel's father was a cow farmer and Sting's father sold milk on his ships. Connected by fathers, the two of them interweaved with each other's catalogs for just under three-hours in the greatest co-headline tour I have ever witnessed. Brothers with different mothers, Sting and Gabriel brought out the best in their respective catalogs. Up first was Peter Gabriel who took the stage for the gradually erupting "The Rhythm of the Heat". The stage was dim but featured most of the extended band. Gabriel delicately delivered the first blow with a flabbergasting dual-drum finale, accentuated by the added percussionist from Sting's band. Without missing a beat, Gabriel exited the stage and Sting strode onto it with lights up ready to lift the audience with "If I Ever Lose My Faith". When he sung the lyric "You could say I'd lost my belief in our politicians / They all seemed like game show hosts to me", the crowd roared with approval. The entire show was a dichotomy of emotions; marriage and divorce, contentment and wretchedness, light and darkness, birth and death. The stage was large enough to house the fourteen musicians, vivid screens, notable backdrops and stellar sound, but in the end, it was all about the music. Both bands rose to the challenge and pushed each other to extremes. While the bands were designated as the "Red" (Gabriel) and "Blue" (Sting) teams, Gabriel and Sting performed fourteen songs together over the course of the show. "Digging in the Dirt" and "Invisible Sun" found some penetrating serenading between the two. On the latter, Gabriel's deep voice added indescribable dimensions. On "Shock the Monkey" Sting took over lead vocal duties in a frisky rendering. Watching this made you realize why The Police were never going to be the only vehicle for him, his tastes and energy expand far beyond a three-piece band. Later in the show, Sting once again awed the crowd with a bubbling adaptation of Gabriel's "Kiss That Frog" while Gabriel made "If You Love Somebody Set Them Free" into a lost soulful Stax Records recording giving weight to Sting's writing and Gabriel's creative re-arrangement. The entire evening's performances felt like a call and answer to the previous song. Sting's vitalizing solo numbers played off Gabriel's morose concentration. "Driven To Tears" was muscular as much as it was magical, while "Walking In Your Footsteps" featured a mesmerizing flute solo. "The Hounds of Winter", from the unappreciated 1996 Mercury Falling, was especially evocative with Sting's vocals adding a passionate edge for a lost love. Even "Roxanne" felt novel with a snippet of Bill Wither's "Ain't No Sunshine". Sting was never one to play by the rules. He reunited with the Police when most had given up hope and throughout his storied solo career, he has never shied away from spinning these classic Police numbers on their head. He left the crowd's mouths agape with the Genesis song "Dancing with the Moonlit Knight" used as an extended intro to the rippling riffs of "Message in the Bottle". Gabriel has never voluntarily performance any of his Genesis era material in concert in decades so this was a smart and stunning move on Sting's part. Peter Gabriel delivered shattering tales of the world that left the audience in pieces. Early in the set, he performed his 1992 classic, "Secret World" which is built on vivid tension customarily reserved for a cinematic thriller. In the two decades since "Secret World" appeared on Us in 1992, it has not lit up radio dials, but anyone who has witnessed Peter Gabriel in concert knows it is a central moment of any show. As Gabriel whispered "shhh" into his microphone, the few remaining in their seats stood up because they were intrinsically aware something magical was about to happen. Gabriel's longtime guitarist David Rhodes tickled his guitar strings and took the song into a strapping musical terrain that matched the concentration of Gabriel's lyrics and themes. On his 1992 blistering first-person narrative, Gabriel took us beneath the surface of beauty into a chaotic and bleeding soul yearning for compassion and understanding. He has always matched these deeply personal declarations with some of the most bracing arrangements imaginable touching pop, rock and world music in a way that few could touch. To be honest, the only other counterpart he had who could match his eclectic tastes was Sting. "Red Rain", "San Jacinto" and "Solsbury Hill" evoked a thousand memories in their durable and spot-on performances. Both Sting and Gabriel have slowed their output of albums, Gabriel's official output is has reached a standstill. Since 1993, he has released only one official studio record of new material, Up from 2002. He has had other items of note including a few soundtrack albums, an orchestral covers record, a deluxe So box set and dozens of soundtrack songs. Most recently he released a rather incredible tribute to Muhammad Ali entitled "I'm Amazing". Towards the end of the show, he left the audience stunned with a solemn new song, "Love Can Heal" which was dedicated to Jo Cox, the Parliament member who was brutally murdered last month. Gabriel knew her and as he silenced the crowd, he brought the outside world into the arena. There are those who feel concerts are for entertaining but I have always felt art answers to a higher power that has the potential to transform, enlighten, educate and above all else make us more empathetic to others in the world. I just hope he finds the right vehicle for these songs because we need them. Before Sting and Peter Gabriel performed "Fragile" together, they took a moment to talk to the crowd about the recent tragedies in the world. It was an emotionally wrecking performance. These two artists share a common thread in eloquently finding a way to paint sophisticated pictures that intricately human. They are showing us how they are still relevant, vital and evolving. Inside the United Center, these songs burst to life and shook me to my core making me think I was hearing them for the first time. Both of them appear to be reinventing their art by revealing diverse creative shades no one knew existed. Gabriel tours so infrequently that any time he's willing to take the stage and share his tales of love, wonder and heartache is an occasion in itself, and yet somehow Sting helped him up the ante this time around. With two bands tackling the music, there were inconspicuous rhythms and chimes evoking the images of our fight for survival in a world where the odds are stacked against all of us. Sting and Gabriel are both esteemed artists who did more than distract us from our troubles but who infused world music into their artistic vision bringing their audience along for the educational ride. They also dared us to look out of our own bubbles to confront the troubles of the world and even ripped open their deepest fears and heartaches in a pair of masterpieces from the 1990s, Us and The Soul Cages. Closing out the show both men performed their biggest hits, "In Your Eyes" and "Every Breath You Take", but it was the closing song, "Sledgehammer", that brought it all into focus. After an evening of concentrated internal reflection, they stood shoulder-to-shoulder playfully singing Gabriel's only number-one from thirty years ago this month. There was a lot of joy in the room. Life is about discovery and these two artists have helped me discover so much that I could never pay them back. Like their fathers before them, they have found common ground in the need to encapsulate the human experience in their music. They have walked down different paths, but both have mined their souls for the betterment of their audience. Peter Gabriel and Sting would take turns on infecting the audience with horror while the other with hope. Gabriel works in the shadows occasionally common up to see the sun whereas Sting embraces the light, wraps his arms around it and it was the tug of war that made the Rock Paper Scissors tour an utterly engrossing experience. 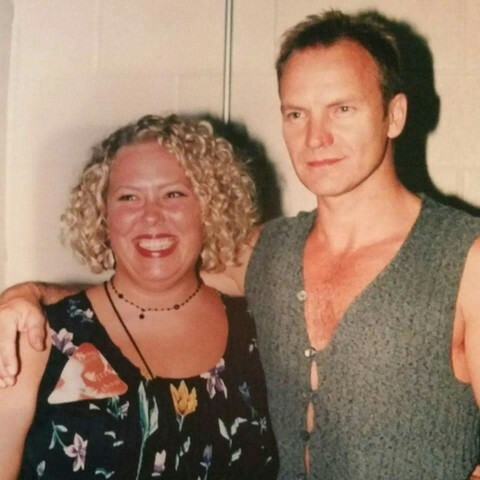 I had the pleasure of meeting Sting on the Mercury Falling Tour on June 25, 1996 when he played at The Pyramid in Memphis, Tennessee. My best friend was with me and was able to meet you as well. I live in Florida now and will be traveling to the show in Chicago on July 9th. My best friend is coming with me to celebrate 20 years since the show in Memphis and being able to meet you! We would love the opportunity to be put on the list for a meet and greet with Sting and Peter Gabriel. You have both been so instrumental in my life not only from the music aspect of your careers but also with the various initiatives you support in order to make this world a better place. It would truly be another dream come true to have this opportunity to meet you again and to meet Peter for the first time. Two brilliant, powerhouse musicians in the same night, in one of my favorite cities...life doesn't get any better! As an aside, I had an earlier encounter with Sting on RockLine (Rock 103 - Memphis, TN) on November 7, 1994. I kept dialing in and finally got through and they asked me what my question was for Sting and then they put me on hold. I prayed that the line wouldn't get disconnected! Eventually it was my turn. I remember wishing Sting a happy belated birthday since his had just passed on October 2nd. It was also International Drum Month so I won some gear, drum head, drum sticks and a signed CD. It was truly an amazing experience! I am hopeful that someone on your staff team will see this and reach out to me about a possible meet and greet for the Chicago show. Kind Regards, Amber L.
Taking my 16 year old twin sons to see Sting for the first time . They love Stings music and have since they were toddlers.